What is the difference between clutter and repurposing something? If it’s clutter then shouldn’t we just get rid of it? Instinctively I would say yes! Toss it or donate it. Get it out of your house. But you know what? That’s not always true. Maybe something is clutter because we just haven’t found the right use for it. However, I would use caution when thinking this way if our homes really are just filled with a bunch of stuff we don’t love or that doesn’t make us happy. See Wednesday’s post. But I think there are a few occasions when keeping something rather than booting it out the door is okay. And I’d love to know if you’ve actually ever really booted something out the door! In my challenge for this month, I suggested we get rid of at least one thing every day. I’d like to alter that a bit. If you choose option 2, then I add an additional challenge: since you’re keeping something that you were going to get rid of, you now must get rid of two (2) things the next day. I was re-thinking some things in our bedroom. We don’t have the funds right now to buy anything, not even a can of paint, so I knew that whatever I did would have to be with the things I already have. There’s this pretty little green tray with lovely scalloped edges that’s been sitting on the cedar chest at the foot of our bed for years. 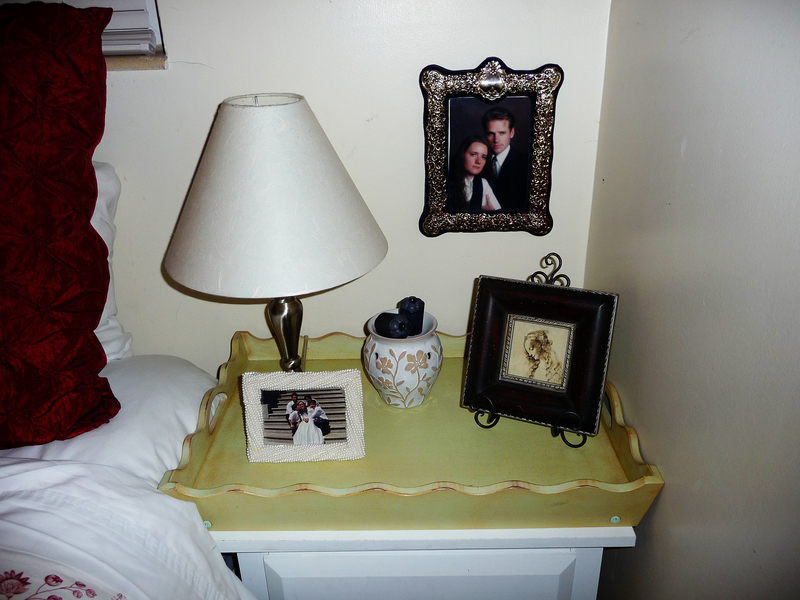 I recently put some picture frames on it to make it look like it had a reason for being there. The picture frames are all mismatched, some are the wrong color and the mix of them together looked awful. The little kids kept grabbing the picture frames and banging them on the scalloped tray. They also kept pushing the tray off the cedar chest and onto the floor. Needless to say it wasn’t being treated nicely. If it could talk, I’m sure it would’ve had a few words to say! And on top of that, our blankets kept knocking over the picture frames. Yes, epic fail is the right term. It just looked out of place; I couldn’t figure out what to do with it. And because it had no purpose it was on the fast track to being clutter. But I love it, think it’s pretty and want to put it somewhere. But the only place I could think to put it besides the foot of our bed was the storage shed. And then it would be clutter for sure. This is my nightstand before doing anything different. Plain, boring and just blah. Our walls need some color and the lampshade could also use a facelift, but remember I’m working with what I have now. So there it is; an almost clutter situation turned beautiful. Now I get to get rid of 2 things tomorrow. I’m loving this challenge and I’m taking it seriously; I may even boot something out the door! Don’t worry. I’ll make sure none of my children are in the way. 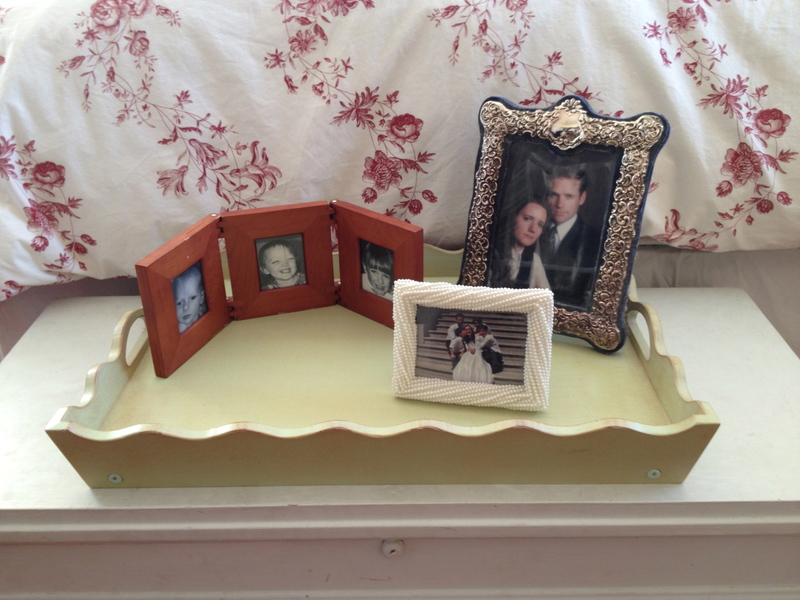 This entry was posted in Cleaning, Organizing and tagged clutter, repurpose. Bookmark the permalink. Wow, what a difference! 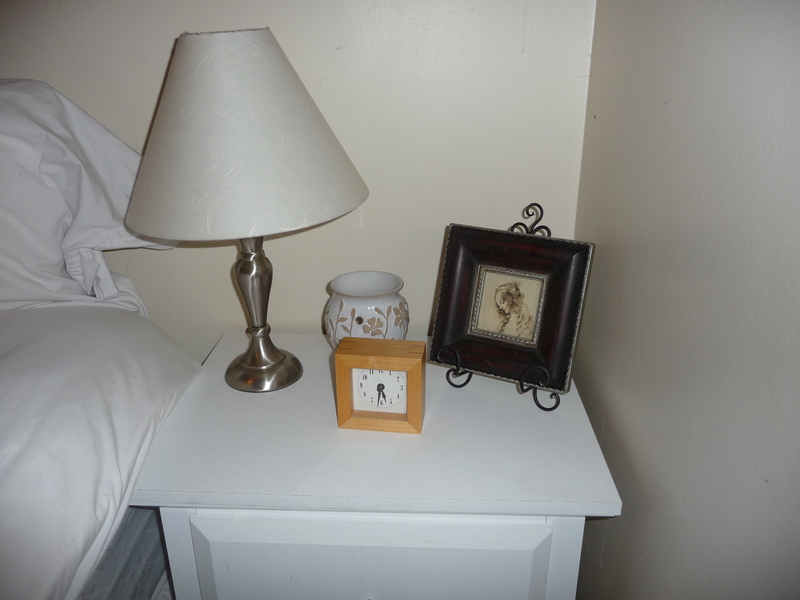 Your night stand looks awesome, now! Thanks, Becky! I’m starting to look at lots of things in a different light now…move this here, move that there…you get the idea. Excited about the changes!